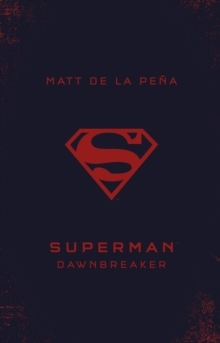 The blockbuster DC Icons series that began with Leigh Bardugo's Wonder Woman, Marie Lu's Batman, and Sarah J.
Maas's Catwoman continues with the story of the world's first super hero - SUPERMAN - from award-winning and #1 New York Times bestselling author MATT DE LA PENA. Clark Kent has always been faster, stronger, better than everyone around him. He knows drawing attention to himself could be dangerous but lately it's difficult to stay in the shadows. A dark secret is lurking in Smallville and he's not the only one hiding something. With his best friend, Lana Lang, at his side, Clark is determined to discover what evil lies below the surface of their small town. But there are secrets in Clark's past that threaten to destroy the future Man of Steel.